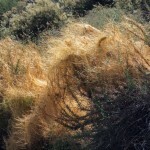 Witches Hair, Devil’s Ringlets, Hairweed . . . This is not your father’s dodder! I had nearly forgotten about how impressive western dodder was when we moved east. The sight of chaparral plants slowly and methodically being consumed by numerous deep-yellow tendrils this spring jiggled my memory. As spring progressed, the density of the dodder increased and so did my curiosity. It was time to renew my acquaintance with dodder (Cuscuta sp.). 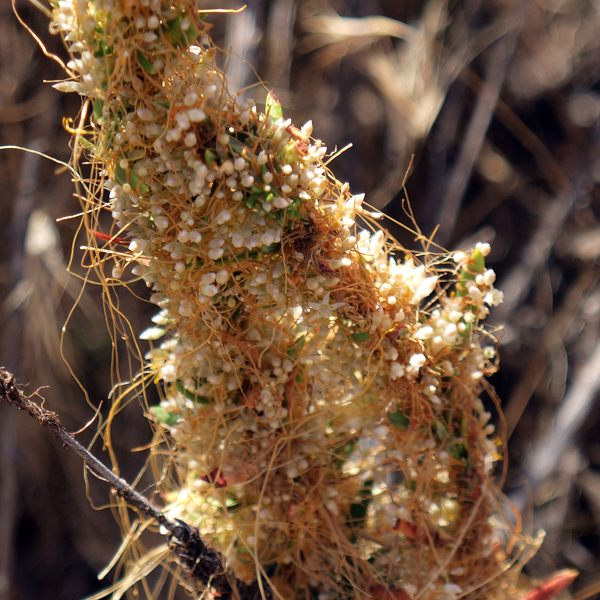 Witches Hair, Devil Ringlets, Hairweed are amongst the many negative, but somewhat descriptive, common names of the plant dodder. 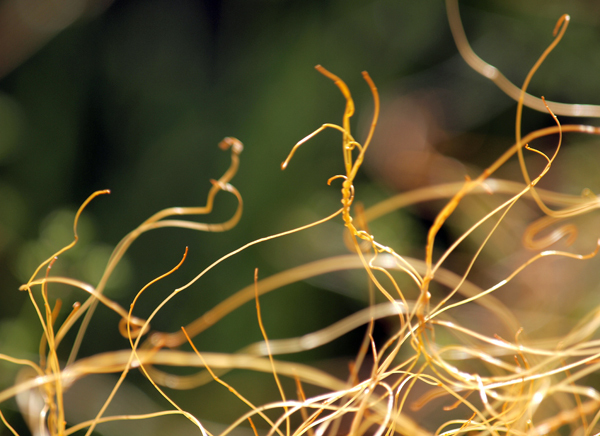 Dodder is actually found throughout the temperate and tropical regions of the world. I am sure that I came in contact with less impressive dodder species in both Ohio and Pennsylvania but it was the western dodder that is so impressive and provoked my curiosity. 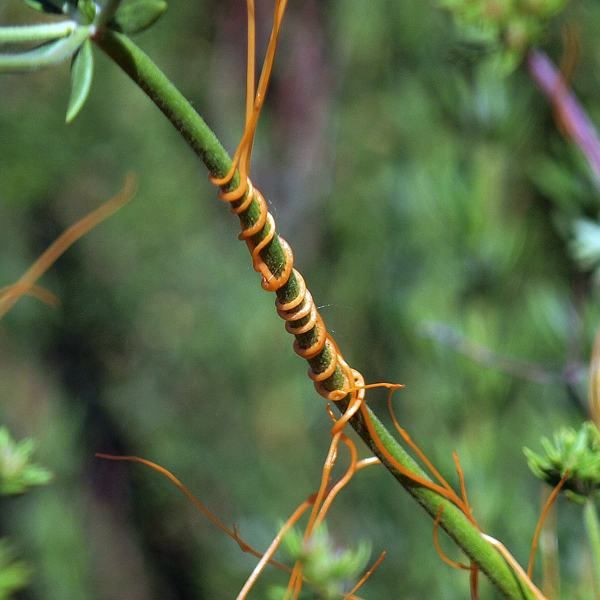 Dodder was originally placed in its own family, Cuscutaceae. Genetic studies since have concluded dodder is related to the Morning Glory family, Convolvulaceae. Dodder is now rightly reunited with its family. It’s my guess that, some time way back when, a morning glory tendril was sent out to a nearby plant to secure its parents plant location. Once the tendril had securely snarled itself around the stem of the other plant and watched the flower and leaves travel on out of sight, the tendril probably wondered why it was being left behind. Getting together with other morning glory tendrils in the immediate area, the tendrils eventually decided that they could easily come up with a more efficient design. No chlorophyll factories, minimal root systems, no heavy flowers to maintain and support. The new design would be 91 percent tendrils, 3 percent roots, and 6 percent flowers. And after a certainly large number of dead-end models dodder was born. 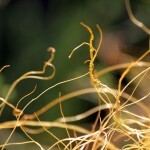 Today dodder survives in 100-170 different forms worldwide. Dodder is a parasitic plant with only several species producing minimal chlorophyll. 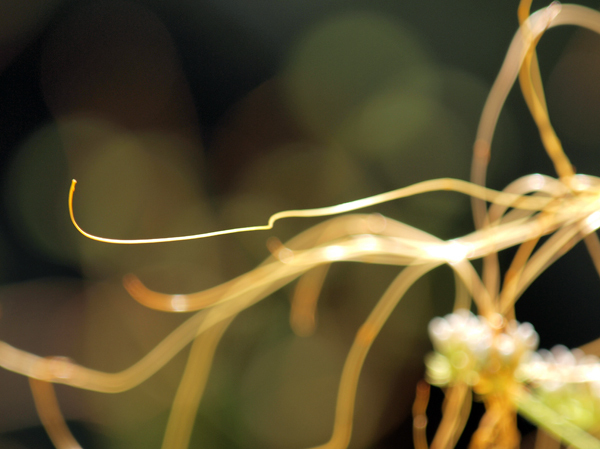 Dodder lives entirely off the nutrients of its host plant. 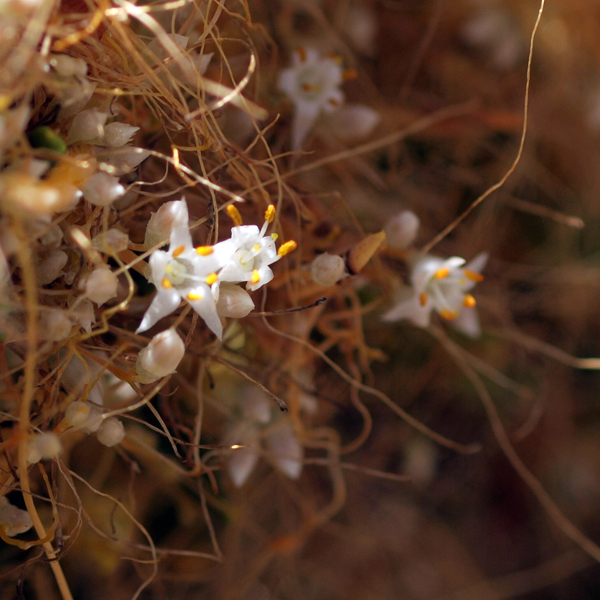 The numerous tiny dodder flowers produce one seed each after blooming in late spring or summer. The seeds of dodder can survive 5-10 years. When a seed germinates in the spring the emerging tendril must find a host plant within a very short time or the dodder will die. 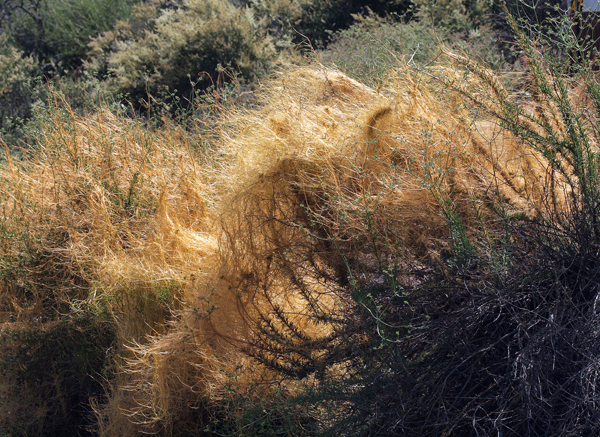 Once a host plant connection is made the dodder’s minimal root system dies. It seems obvious to me that the tendrils did come up with a very efficient system for sustainability and they made it all about tendrils. GO, tendrils! I still wondered how after the seed germinates the lone tendril finds a host plant. I expected that it was most likely “random floundering” by the tendril. Success would hinge on whether the tendril was lucky enough to hit the host plant on a lucky flounder. Little did I know that the Tendril Advancement Society (TAS), formed in the late stages of dodder development, had already drawn up plans to solve this problem as well. A report published in Science (Vol. 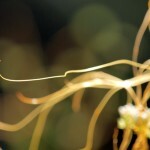 313; Sept. 29, 2006) demonstrated that dodder used airborne chemical cues to locate their host plants. Those darn tendrils are very clever – WOW! 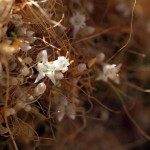 The literature indicates that dodder seldom kills the host plant, albeit, dodder surely provides the host plant with a very miserable growing season. 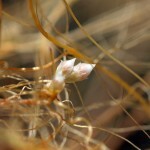 The host plant provides dodder all the room and board at no cost to the dodder. It’s kind of similar to having a non-contributing family member moving in to your home for a year and constantly complaining that the TV remote won’t work. 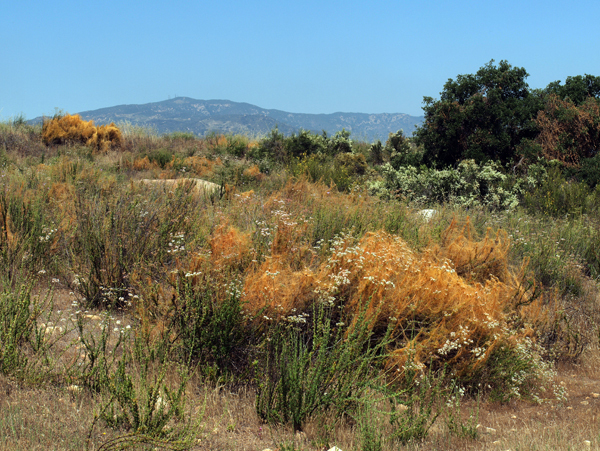 I cannot attest to the non-lethal aspect of dodder on the host plant but have staked out a couple chaparral plants to check later this season and again next year. Does this nasty plant have any positive benefits? It appears that it does. 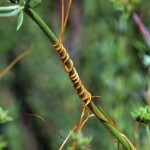 Chaparral Dodder (Cuscuta californica) is the preferred host plant for the larvae of the Western Brown Elfin butterfly. I will be interested to see how the TAS deals with this problem which I am sure is not a welcome event.